Bacellar, I. O. L., Baptista, M. S., Junqueira, H. C., Wainwright, M., Thalmann, F., Marques, C. M., et al. (2018). Permeability of DOPC bilayers under photoinduced oxidation: Sensitivity to photosensitizer. Biochim Biophys Acta, . Abstract: The modification of lipid bilayer permeability is one of the most striking yet poorly understood physical transformations that follow photoinduced lipid oxidation. We have recently proposed that the increase of permeability of photooxidized 1,2-dioleoyl-sn-glycero-3-phosphocholine (DOPC) bilayers is controlled by the time required by the oxidized lipid species to diffuse and aggregate into pores. Here we further probe this mechanism by studying photosensitization of DOPC membranes by methylene blue (MB) and DO15, a more hydrophobic phenothiazinium photosensitizer, under different irradiation powers. Our results not only reveal the interplay between the production rate and the diffusion of the oxidized lipids, but highlight also the importance of photosensitizer localization in the kinetics of oxidized membrane permeability. de Oliveira, T. E., Marques, C. M., & Netz, P. A. (2018). Molecular dynamics study of the LCST transition in aqueous poly(N-n-propylacrylamide). Phys Chem Chem Phys, 20(15), 10100–10107. Abstract: The breadth of technological applications of smart polymers relies on the possibility of tuning their molecular structure to respond to external stimuli. In this context, N-substituted acrylamide-based polymers are widely studied thermoresponsive polymers. Poly(N-n-propylacrylamide) (PNnPAm), which is a structural isomer of the poly(N-isopropylacrylamide) (PNIPAm) exhibits however, a lower phase transition in aqueous solution. In this work, we use all-atom molecular dynamics simulations of PNnPAm in aqueous solutions to study, from a microscopic point-of-view, the influence of chain size and concentration on the LCST of PNnPAm. Our analysis shows that the collapse of a single oligomer of PNnPAm upon heating is dependent on the chain length and corresponds to a complex interplay between hydration and intermolecular interactions. Analysis of systems with multiple chains shows an aggregation of PNnPAm chains above the LCST. Kluzek, M., Schmutz, M., Marques, C. M., & Thalmann, F. (2018). Kinetic evolution of DOPC lipid bilayers exposed to alpha-cyclodextrins. Soft Matter, 14(28), 5800–5810. Abstract: Cyclodextrins are cyclic oligosaccharides capable of forming inclusion complexes with a variety of molecules, and as such have been recognized as a pharmaceutical and biotechnological asset. 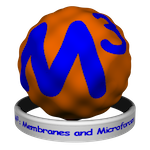 Cyclodextrins are known to interact with the components of cell membranes, and this correlates with a significant degree of cytotoxicity. In this work, we report on the mechanism of degradation of a model dioleoyl-phosphatidylcholine (DOPC) bilayer exposed to a solution with increasing concentrations of alpha-cyclodextrins. By combining optical fluorescence microscopy and quartz-crystal microbalance experiments, we study the evolution of supported lipid bilayers (SLBs) and giant unilamellar vesicles (GUVs). The rate of lipid removal is found to display a strong nonlinear dependence on the cyclodextrin concentration. A mechanism involving lipid aggregates is proposed. Morandi, M. I., Sommer, M., Kluzek, M., Thalmann, F., Schroder, A. P., & Marques, C. M. (2018). DPPC Bilayers in Solutions of High Sucrose Content. Biophys J, 114(9), 2165–2173. Abstract: The properties of lipid bilayers in sucrose solutions have been intensely scrutinized over recent decades because of the importance of sugars in the field of biopreservation. However, a consensus has not yet been formed on the mechanisms of sugar-lipid interaction. Here, we present a study on the effect of sucrose on 1,2-dipalmitoyl-sn-glycero-3-phosphocholine bilayers that combines calorimetry, spectral fluorimetry, and optical microscopy. Intriguingly, our results show a significant decrease in the transition enthalpy but only a minor shift in the transition temperature. Our observations can be quantitatively accounted for by a thermodynamic model that assumes partial delayed melting induced by sucrose adsorption at the membrane interface. Mukherji, D., Marques, C. M., & Kremer, K. (2018). Collapse in two good solvents, swelling in two poor solvents: defying the laws of polymer solubility? Journal Of Physics-Condensed Matter, 30(2). Abstract: In this work we discuss two mirror but distinct phenomena of polymer paradoxical properties in mixed solvents: co-non-solvency and co-solvency. When a polymer collapses in a mixture of two miscible good solvents the phenomenon is known as co-non-solvency, while co-solvency is a phenomenon that is associated with the swelling of a polymer in poor solvent mixtures. A typical example of co-non-solvency is provided by poly(N-isopropylacrylamide) in aqueous alcohol, while poly(methyl methacrylate) in aqueous alcohol shows co-solvency. We discuss these two phenomena to compare their microscopic origins and show that both can be understood within generic universal concepts. A broad range of polymers is therefore expected to exhibit these phenomena where specific chemical details play a lesser role than the appropriate combination of interactions between the trio of molecular components. Yan, X., Stocco, A., Bernard, J., & Ganachaud, F. (2018). Freeze/Thaw-Induced Carbon Dioxide Trapping Promotes Emulsification of Oil in Water. J Phys Chem Lett, 9(20), 5998–6002.